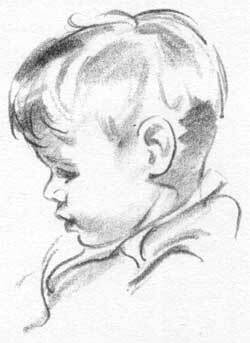 Here are two sketches of a child of five. I was lucky in the first one though David was not so lucky. He had a " bit of a cold" and didn't feel too lively. He looks sorry for himself doesn't he? I think there is always a touch of whimsy in children, and it's that that makes us love them. Of course, he didn't sit still for many minutes at a time, but I just waited until he got back more or less. 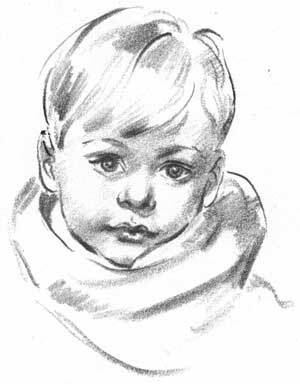 Nearly always, it is necessary to do three or four quick sketches before one of them is good enough to make a portrait, and even then one usually has to finish it from the other sketches or notes.